Alright. 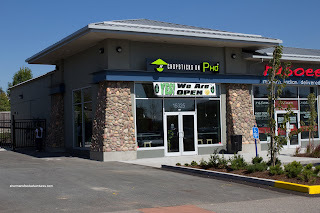 We are pretty familiar with the typical Pho joint right? Usually pretty crappy looking exterior with an equally confusing interior. The decor could resemble a Greek, Italian or Indian restaurant, but it is unmistakably a Vietnamese restaurant. Hey, I ain't complaining. The food usually speaks for itself and the prices are easy on the wallet. 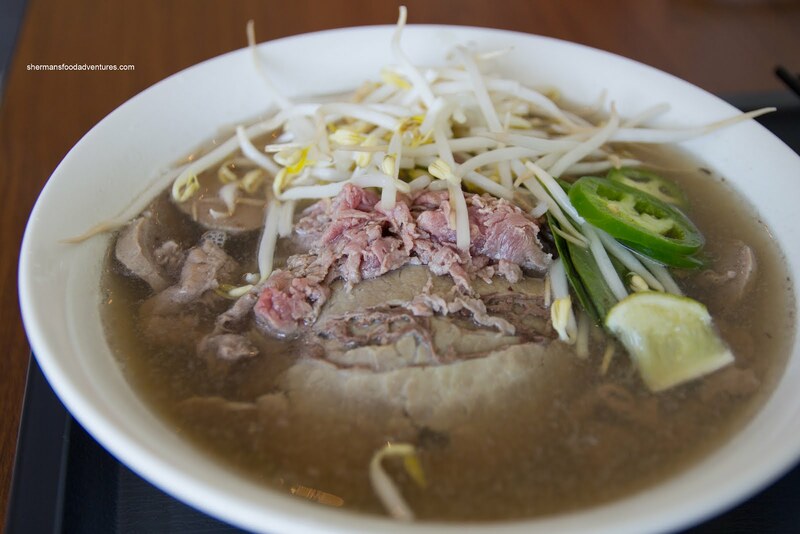 However, there seems to be a trend towards "nice-looking" or even upscale Vietnamese dining. Take Broken Rice for instance. 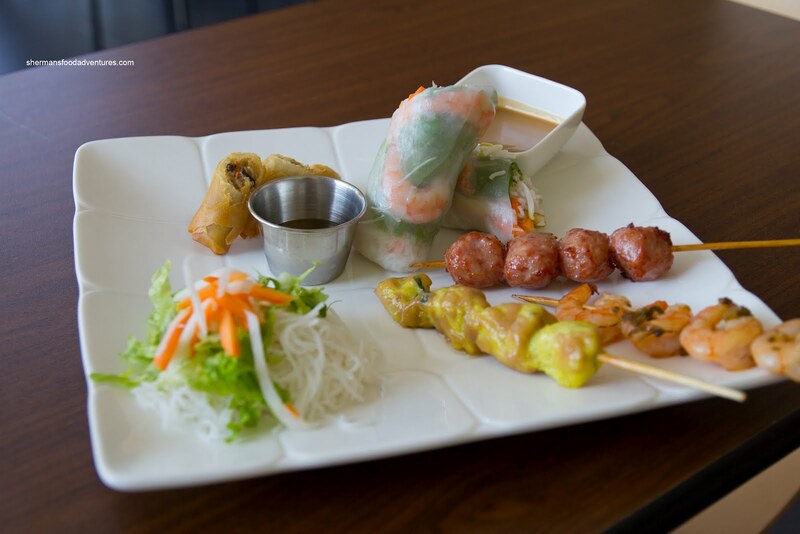 The place is designed from the ground up as a Vietnam ese restaurant. Furthermore, the food is both refined and no longer "value-priced". 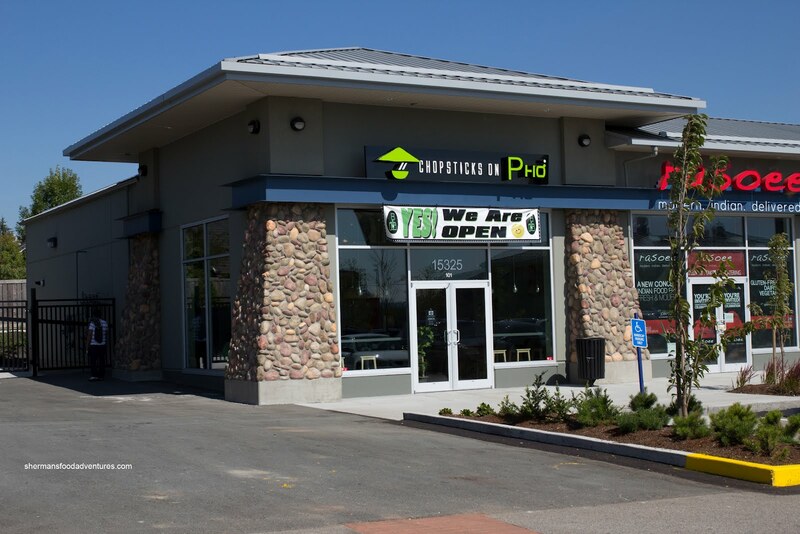 With that in mind, I was curious about the latest entry into the "classy" Pho arena - Chopsticks on Pho out in Surrey. Joining me was Mrs. Spray Bottle, who shared a Tasting Platter at the end of our meal. Yes, we didn't start with it because it took awhile to prepare, but I'll talk about it first anyways. It included skewers of BBQ Nem Pork, Satay Chicken, Grilled Garlic Prawns, Spring Roll and Salad Roll. Although the spring roll was good with a crispy exterior and moist filling, I was dismayed at the use of a wheat wrapper. The salad roll was really good with a nicely textured rice wrapper and fresh ingredients. The pork and chicken skewers were carefully prepared, hence they were moist and tender. I particularly loved the pork skewer as it was quite flavourful. The snappy prawns were more like shrimp and they could've done a better job at deveining them. Mrs. Spray Bottle ended up with the Banh Mi which was ridiculously priced at $8.95. It was made with lemongrass chicken with the usual condiments including pickled daikon and carrots, cilantro, jalapeno and a house aioli (in place of the regular butter mayo). The sandwich was pretty good with a crusty baguette and crisp veggies, however, there could've been a more pronounced lemongrass hit. For myself, I had "The Works" Pho (aka Pho Dac Biet minus the tripe and tendon). I found the broth sweet and somewhat fragrant. It could've used more meat depth and savouriness. The noodles were al dente while the modest amount of meat was tender. In general, we enjoyed the food here, but there was one thing that kept bugging me - the prices. I realize the place is clean and modern while the food is neatly presented. Yet, that comes with a price, which is an average $3.00 premium over regular Vietnamese joints. We'll have to see if people are willing to shell out the extra money in the long run. Holy moly !! $9 for a banh mi ?!? That's Meat & Bread price range and more than Big Lou's ! @LR Yah, imagine my reaction when I saw that. 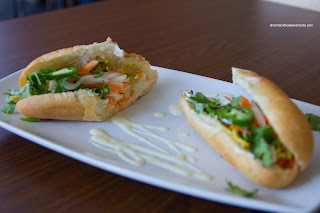 It is a good Banh Mi, but not worth the price at all. Should be like $5.00.